Glenn and I are hosting a Boxing Day brunch tomorrow morning and I’ll be assembling this ham and cheese strata before tucking in tonight. It will come right out of the fridge and pop into the pre-heated oven a half hour before we plan to eat. This recipe serves six but can easily be scaled up or down to suit the number at your table. It might sound odd, but I use Sweet Thai Chili sauce in the strata for added zing! Give it a try – you’ll find it adds a unique flavour to a tried and true brunch favourite. Sauté onions in melted butter until softened and beginning to brown – remove from heat and cool slightly. Place half of the cubed croissants into a large casserole dish or 6 individual ramekins. Add half of the ham, sprinkle on half of the sautéed onions, ½ of the cream cheese chunks and half of the grated cheddar cheese. Repeat this layering process ending with the rest of the grated cheddar cheese. Wisk the eggs, milk, Sweet Thai Chili sauce, Dijon mustard, garlic powder, thyme, salt and a grinding of pepper together in a large measuring cup. Pour the egg mixture over the casserole (or spread evenly amongst the ramekins) and cover with plastic wrap. The strata(s) can now be refrigerated overnight. In the morning pre-heat the oven to 350F and place the strata on the middle rack once the oven is hot. 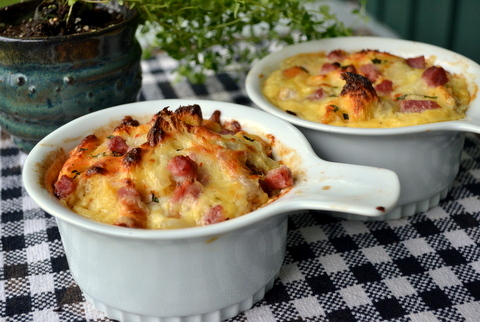 Bake for 30 minutes (20 – 25 minutes for individual ramekins). To test for doneness insert a metal skewer into the centre of the strata. If it comes out clean the strata is ready to serve.